Manx Trax & Trails was established to provide specialised, year-round Guiding Packages for trial bike riders visiting the Isle of Man from the UK and further afield. From novice off-roaders to seasoned bike handlers, our aim is to make life as easy as possible for you during your weekend adventures here – so that you spend more time negotiating the tracks and less time wondering where to go! 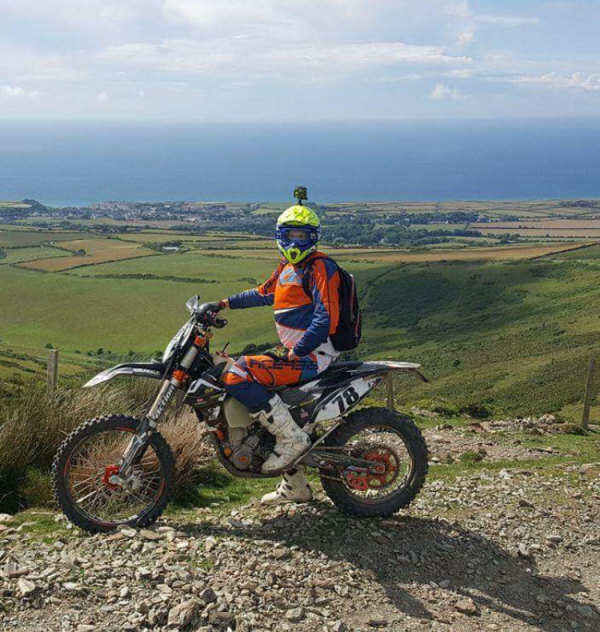 Whether you are a regular visitor from the UK, or travelling to the Isle of Man for the first time, we are passionate about everything relating to enduro and trial riding, in fact all things off-road and dirt bike connected. We’ve assembled an accomplished team of Guides (some might say obsessive bike riders!) so you can benefit from our unrivalled local knowledge. We won’t be racing, but by introducing you to some of the finest green lanes and trail riding anywhere in Britain, if your bike prowess improves as a result – then that’s fantastic. The Island’s geography lends itself to off-road two wheelers. From steep and rocky, to flatter faster sections interspersed with rutted and technical terrain, set against stunning scenic backdrops – it’s made for you! Manx Trax and Trails’ Guides will help you locate the green lanes quickly and easily, so that there’s a flow to the riding. We’ll make sure there’s as little time as possible spent on open tarmac roads. We generally work with groups of up to eight. Anything larger and we’d usually recommend and provide a second guide. Itineraries can be tailored to suit your levels of ability. Everything’s really flexible. Plus, all your Travel and Accommodation arranged! At Manx Trax and Trails, we’re passionate about off-road trial biking and we want you to get the absolute max out of riding our fantastic network of green lanes and tracks. We know how eager you are to get out there on the bikes. Let’s go have some fun! For the ultimate “dirt bike” friendly location – you’re on the right track! Manx Trax and Trails organise the best guided green lane and off-road trial riding experiences in the Isle of Man. Round up your mates, pack your bikes and kit onto the van and take the ferry here for some of the most outstanding enduro/off-road biking adventures the UK has to offer.